Skiers whooshing past this picturesque ski resort may want to slow down to take in its stunning beauty. Located in the Caucasus mountain range in Gudauri, Georgia, the Quadrum Ski and Yoga Resort resort is almost entirely made out of repurposed shipping containers and tucked into the terrain with steel supports that reduce its environmental impact. The shipping container resort offers guests a tranquil space to both relax and explore the amazing landscape. Built into the mountainside using a pyramid-like scheme, the containers were structured to cascade down the terrain, supported by steel posts in order to leave minimal impact on the environment. The resort has five levels, with the reception and dining area on the first floor and the guest rooms topped on one another. 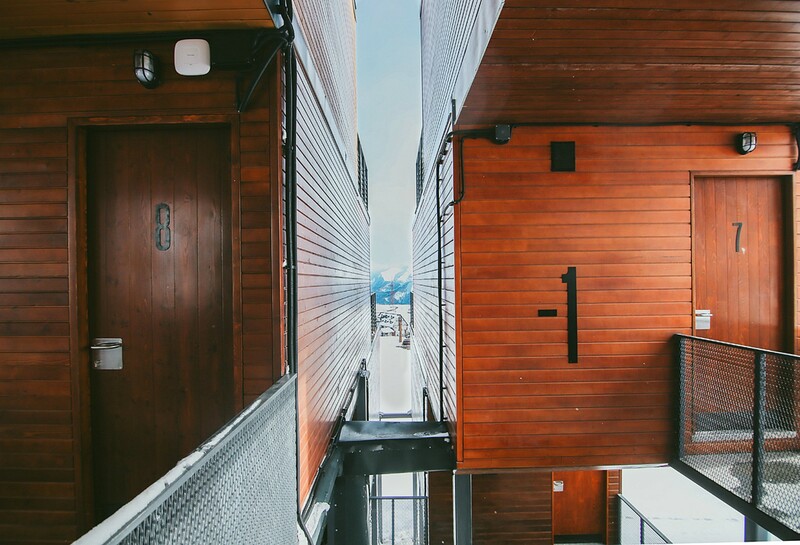 The guest rooms are made up of individual containers clad in wood paneling, each with a glazed wall that leads out to an open-air deck to enjoy the stunning views. The resort offers single rooms as well as larger family and deluxe suites. In addition to many skiing trails found in the area, the resort also offers yoga classes and other healthy activities such as swimming. 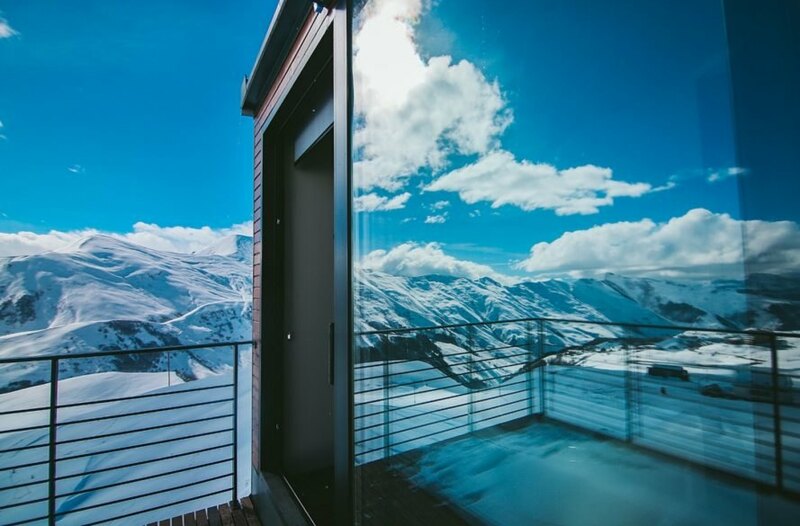 Of course, for those who’d just like to sit back and relax after a day of whizzing through the mountains, there’s also a toasty sauna. 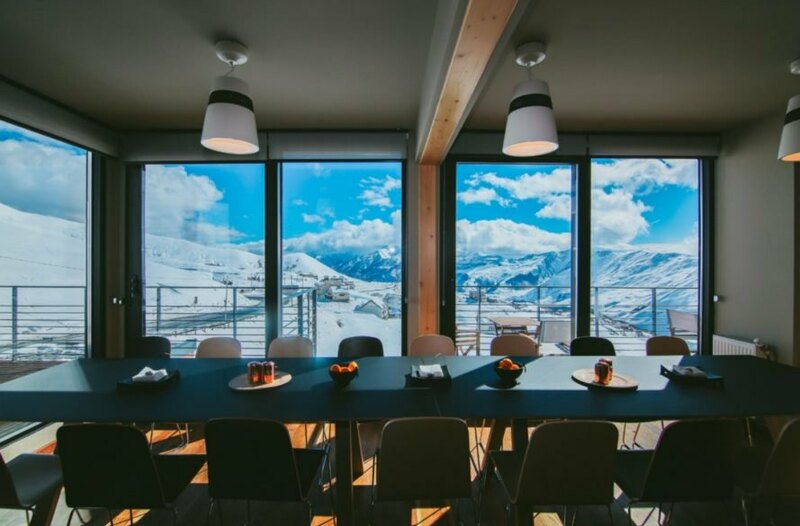 Skiers whooshing past this picturesque ski and yoga resort may want to slow down to take in its stunning beauty. 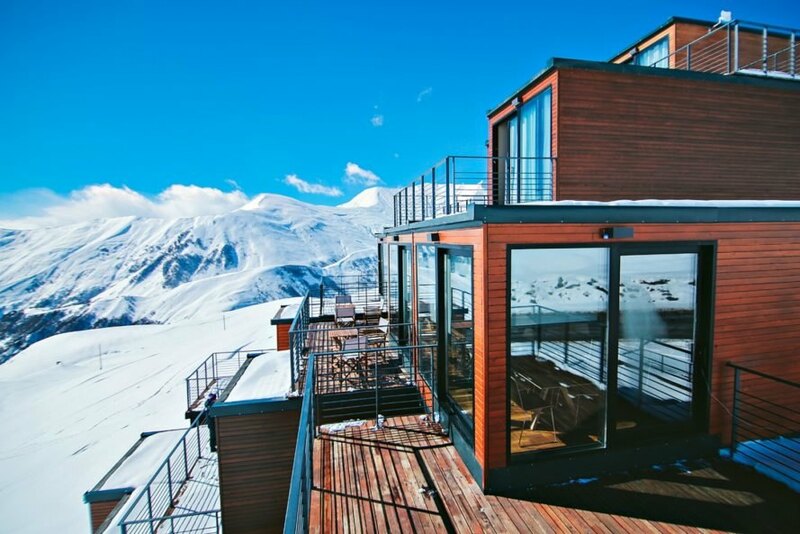 Located in the Caucasus mountain range in Gudauri, Georgia, the Quadrum Ski and Yoga Resort resort is almost entirely made out of repurposed shipping containers and tucked into the terrain by metal stilts in order to reduce its environmental impact. The shipping container resort offers guests a tranquil space to both relax and explore the amazing landscape. Built into the mountainside into a pyramid shape, the containers were structured to cascade down the terrain, supported by a a series of steel posts in order to leave minimal impact on the environment. The hotel has a strong connection to its natural surroundings. The resort has five levels, with the reception and dining area on the first floor and the guest rooms topped on one another. The guest rooms are made up of individual containers, each clad in wood paneling, and a glazed wall with a large front deck to enjoy the stunning views. The resort offers single rooms as well as larger family and deluxe suites. 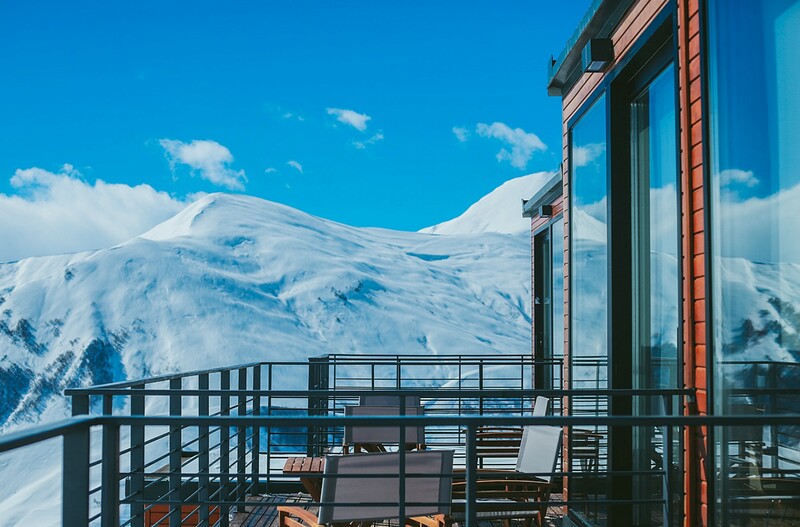 In addition to breathtaking skiing found in the area, the resort also offers yoga classes and other healthy activities such as swimming in their onsite pool. The dining room is located on the first floor. 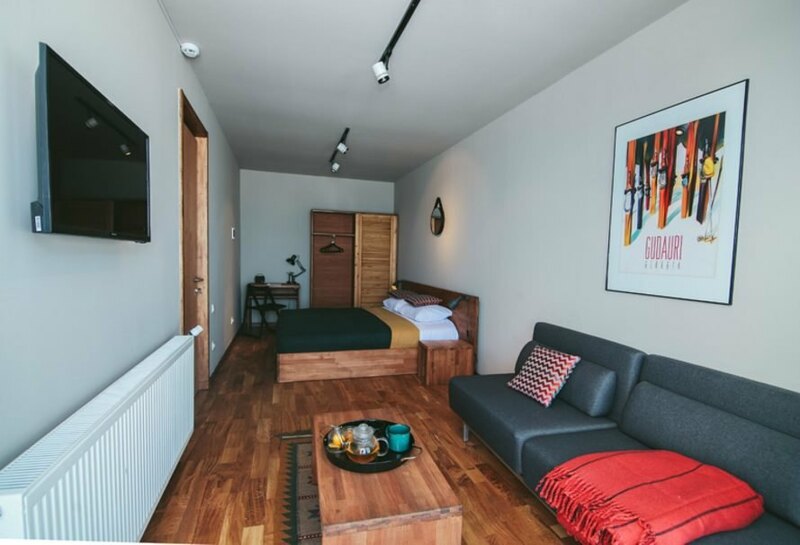 For those who'd just like to sit back and relax after a day of whizzing through the mountains, there's also a toasty sauna. There are plenty of relaxing spaces in the resort. 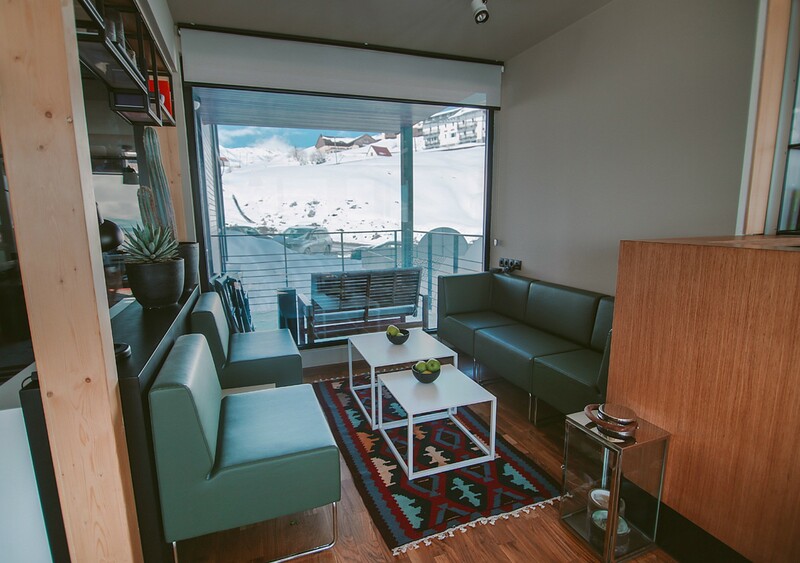 Guests can sit back and read in the lounge area. 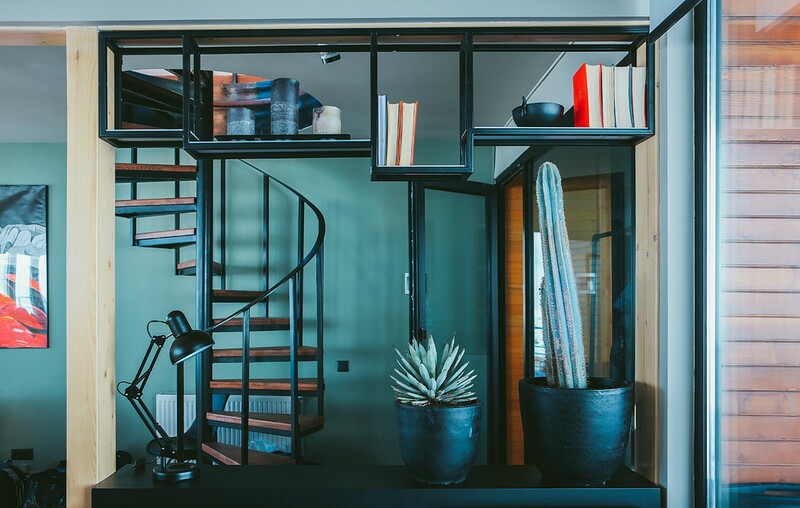 A beautiful metal staircase leads up to the upper level. Each room has stunning views. Quadrum Ski Resort has plenty of areas to relax. Each guest room is made out of individual containers. There are single and deluxe suites on offer.